The MxPro 5 series is fully expandable from 2 to 8 loops and supplied with 8 on-board sounder circuits, 20 programmable Zonal LEDs with slide-in labels, and 25 System LEDs for information purposes. There are also 8 programmable function buttons with LED indication for confirmation of operation. The control panel consists of the latest dual flash-based microprocessor technology combined with a high resolution, high contrast, graphical LCD display and tactile keypad providing a simple select & click programming aid for engineer configuration and end-user operation. Powerful cause-and-effect programming coupled with dynamic zoning, and enhanced Trace Diagnostics makes the panel suitable for a wide range of site applications from small to large complex multi-area systems. 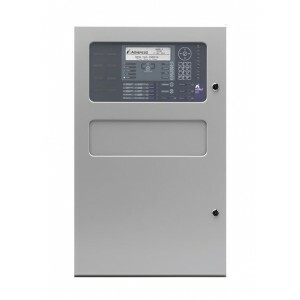 Fully programmable onsite via the on-board alphanumeric keypad, or PC-NeT configuration software. An extensive suite of user-friendly Windows based PC software programs has been developed to enhance your experience when using MxPro 5 series fire panels. The suite incorporates a number of different programmes to include a configuration, service, logo and virtual panel tool to allow the flexibility of the equipment to be fully explored. Simply adding a network card allows the panel to communicate with any other MxPro 5/MxPro 4 fire panel, remote terminal, or network peripheral, such as, ipGateway™ or BMS/graphical interface. The network operates as a true peer-to-peer system and can be configured in a fault tolerant loop or radial format. Fully expandable from 2 - 8 loops via plug-in loop driver boards. 20 programmable Zonal / 25 System LEDs with slide-in labels. Dedicated loop driver for Apollo or Hochiki protocol support. The graphical display can be configured to operate with virtually any language or character set, and allow the installer's logo to be applied using the Logo application software.